This entry was posted in Medication Dependence, Mental Health and tagged MAT, Medication Tapering, Medication Titration on January 18, 2019 by ATMC Team. Why Taper or Titrate Medication? For many individuals seeking to come off of medication safely, stories of dramatic symptoms caused by medication withdrawal may create some doubts about the process. It is well known that to reduce the chances of extreme symptoms caused by coming off medications cold turkey, medication tapering and titration may be introduced by a local doctor or inpatient mental health facility. But why is Titration Tapering so much safer and less dangerous than quitting medications cold turkey? For some individuals, the medication withdrawal process could lead to symptoms that affect mental health, physical health or both. In fact, many medications such as Opioid pain pills, or Benzodiazepines, have withdrawal effects as dangerous as alcohol withdrawal. The potential for extreme acute symptoms leads many to check in at a inpatient detox or inpatient mental health center to monitor their withdrawal. However, a rapid detox (usually 3-7 days) is not always the wisest choice for someone wanting a long term healing of symptoms. Many forms of tapering methods have been developed to assist in the safe reduction of prescribed or abused prescription medications that lead to a higher likelihood of long term recovery from medication dependence. Follow the associated links to read more about popular methods of medication tapering used at the licensed and holistic Alternative to Meds Center such as:Substitution Tapering, Medication Cross-Over, the use of Bridge Medications, or even common symptoms associated with Inter-Dosing Withdrawal. Why Consider Titration Tapering Versus Quitting Cold Turkey? If you are looking into ways to titrate down medication, or seeking information on tapering methods, it is likely that you plan on reducing the dose of a prescribed medication. For some types of medications, such as benzodiazepines, antidepressants, or ADHD medication, coming off of the drug cold turkey could lead to some damaging and traumatic symptoms for the user. The goal of any medication taper, or titration schedule, is to effectively lower the dose to a safe level, or eliminate the need for the drug, without causing severe or acute medication withdrawal symptoms. In any case, it is wise to seek the assistance of your local doctor, naturopath, or holistic mental health practitioner when attempting to alter medications. 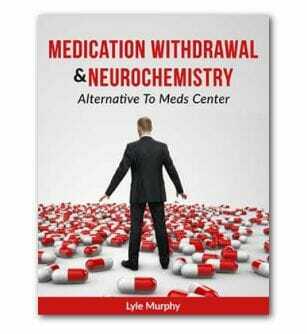 At Alternative to Meds Center, we provide an inpatient holistic center to assist in Medication Withdrawal endeavors. Our program uses methods of medication Titration Tapering in order to guide our patients safely through the process of withdrawal, and to a point of independence from psychiatric meds, or pain pills, whenever possible. In order to understand why tapering and titration have become so popular, you must first understand what these methods involve. What Does it Mean to Titrate Medication? The term titrate is used to explain the process of working with your doctor or a inpatient mental health provider to gradually reduce a medication to the most effective levels. The process is aimed at making any medication withdrawal symptoms as minimal as possible when trying to eliminate a medication or find an effective lower dose of the drug. To Titrate Medications is a process used to analyze the best stopping point of a medication dose. For individuals prescribed a medication such as the Benzodiazepine Xanax, a doctor or licensed practitioner may recommend titration of medication as a means to locate the most effective dose. For example: The usual recommended dose of Xanax (Alprazolam) is .25-.50 mg. Many people ask is .5mg of Xanax a low dose, but depending on the users level of sensitivity, the standard .5mg dose could cause symptoms and need to be adjusted. A doctor supervising the Xanax Titration may feel it’s wise to observe the patient for a period of time on reduced doses to see what the most comfortable baseline level is. As an example, Xanax could be reduced, even a fraction of a mg, and then time given to observe the patient for any abnormal reactions or symptoms. What is a Medication Tapering Schedule? Medication Tapering is a way of slowly reducing a prescribed medication down to the most effective dose. This process is also effective in eliminating a medication completely. A medication tapering schedule could be developed by a willing prescribing doctor, or at a licensed facility, however, there are instances which would demand a medication taper schedule be altered or changed to provide the maximum benefit. A person on a standard dose of 10mg Lexapro (Escitalopram) may be recommended by their doctor to taper the dose of Antidepressant. Let’s say by 1mg a month. This process is used by thousands of people who feel over-medicated, or feel it’s time to quit Lexapro. But, a month between each medication cut could mean that symptoms come up in between the taper levels. If an individual begins to experience withdrawal symptoms that are abnormal, extreme, or lead to medical concerns, the medication tapering schedule may need to be reviewed by the doctor or licensed professional in order to prevent further physical symptoms, or lingering mental health symptoms. At the Alternative to Meds Center medication tapering facility, we find that the best way to achieve medication taper success is to participate in treatments that focus on underlying areas of the brain chemistry. Our neurotransmitter rehabilitation program helps those who are in need of reworking the brain chemistry to provide balance to the moods and overall health. An effective Benzodiazepine taper schedule, combined with adjunctive treatments focused on the brain chemistry, is known to get the highest chance of success eliminating the addictive Benzo medications. Coming off of a prescribed medication for pain, anxiety, depression, trauma, or mood disorders, is often a very rewarding experience for those who are successful in the process. However, the likelihood of problems or symptoms is so high during a medication taper schedule, that monitoring symptoms and seeking professional care is always recommended. A person seeking to taper off of a Benzo for instance, can expect some symptoms of discomfort, regardless of how long they have been on the medication, or the size of their daily dose. Each person, regardless of the medication levels, has experienced changes in the brain chemistry which needs to be addressed in order to fully rebound from Benzo Withdrawal or Benzo dependence. Someone who is experiencing success in their Benzo taper, could simply just be managing the process well enough to function on a daily basis. Being able to continue daily life obligations such as work, school, and family, often become too difficult for those suffering Benzo Withdrawal. So, for anyone going through a medication taper, simply making it through the process, means you are doing okay. At Alternative to Meds center, we use a host of adjunctive therapies, and constant medical observation and oversight, in order to help patient succeed in minimizing the negative effects of their medication taper process. In our center we realize that having the right team of professionals is very helpful in ensuring the success tapering benzos, and have gathered licensed experts from various medical backgrounds to provide our clients a high chance of success. Psychiatric Medication Tapering is not offered by every doctor of inpatient facility in the world, and our program is one of the oldest most experienced centers offering a holistic approach. Weaning off antipsychotics – 10 Year History of Psychosis Treated!